US-led NATO aggression raped and destroyed Libya, transforming Africa’s most developed nation into a cauldron of endless violence, chaos and human misery – what happens virtually wherever US forces show up. In 2011, Libya was terror-bombed and attacked on the ground to destroy its sovereignty, plunder its oil wealth, privatize the world’s largest aquifer system, dollarize the country, exploit its people, and establish pro-Western puppet rule. Muammar Gaddafi was toppled and sodomized to death for supporting pan-Africanism, a United States of Africa free from imperial dominance, and Libyans sharing in the country’s oil wealth, a notion anathema to the US and its imperial partners. Libya today is a dystopian failed state. Dozens of rival factions vie for control, including US-supported ISIS, al-Qaeda and other terrorist groups. 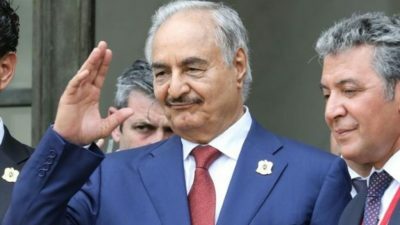 Two main ones are the UN-backed Tripoli-based Government of National Accord (GNA) and the Tobruck-based Libyan National Army (LNA), led by CIA asset Khalifa Haftar. The US and Britain nominally support the GNA. France, Israel, the Saudis, UAE, and Egypt back Haftar. Much of the country is lawless, territory bordering Algeria, Niger, Chad and Sudan a haven for terrorists and other armed groups. Days earlier, his forces began advancing on Tripoli in the West, aiming to defeat the Fayez al-Sarraj-led GNA, calling on area resident to lay down their arms and surrender. He seized control of nearby areas and Tripoli’s international airport. Declaring a state of emergency, GNA forces mobilized to combat his troops. Hafter issued a statement saying he expects the conflict to be resolved by around mid-April – as soon as a new national unity government is formed he seeks control over. On Sunday, his forces bombed a Tripoli suburb where LNA troops are defending the city. According to GNA Colonel Mohamed Gnounou, a counteroffensive dubbed “Volcano of Anger” was launched to combat his advance on the city. On Saturday, the GNA launched air attacks on his forces around 30 miles south of Tripoli. The UN mission in Libya (UNSMIL) called for a two-hour humanitarian truce to evacuate wounded combatants and civilians wanting to leave the city. He warned of “war without winners” if things aren’t resolved diplomatically. Talks between both leaders were held in late February, failing to resolve differences. The “UN and world community ha(ve) doubled down on (an upcoming national) conference…(un)swayed by violence and spoilers” like Haftar. International players differ on Libya, some Western and regional states supporting the GNA, others for the LNA. On Friday, G7 foreign ministers called on parties involved in the conflict to “halt all military activity and movements toward Tripoli, which are hindering prospects for the UN-led political process, putting civilians in danger, and prolonging the suffering of the Libyan people” they don’t give a hoot about. If otherwise Britain, France, and other NATO nations wouldn’t have partnered with the Obama regime’s 2011 aggression in Libya. It’s the root cause behind endless violence and chaos in the country for over eight years, including the ongoing GNA/LNA conflict, showing no signs of resolution so far. On Sunday, an unnamed “top Libyan military source” told Sputnik News that LNA forces failed to heed UNSMIL’s call for a temporary ceasefire so wounded combatants and civilians could leave Tripoli. His warplanes bombed the city, more likely to come if the world community doesn’t intervene to halt fighting.